Pat Gerkin's abstract paintings and encaustics have been exhibited in numerous solo and group shows throughout the Washington, DC area and the Greater Boston and New England area. Her work is in public and private collections in the U.S., South America, and Europe. Memberships include Associate Artist, Torpedo Factory Art Center, Alexandria, VA; New England Wax (N.E.W. ); Ogunquit Artists' Association, Barn Gallery, Ogunquit, ME. Galleries include Mitchell-Giddings Fine Art, Brattleboro, VT; Powers Gallery, Acton, MA; Art3Gallery, Manchester, NH; L'Attitude Gallery, Boston, MA. Although my work is deeply rooted in places and nature, I have chosen to commit to abstraction as my personal expression. 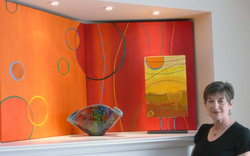 I like to work in the crack between 2-D and 3-D, using paint or encaustic and disparate materials on various substrates. Mixed media gives me the opportunity to bring a sense of history and of unearthing a mystery into the current works. My visual vocabulary is rich in pattern and texture and a sense of something beneath the surface, and I am interested in topography--interior and exterior. American Embassy in Kuwait, Art in Embassies Program, U.S. State Dept., Washington, DC (two paintings), 2016. Fellowship for month-long residency at Vermont Studio Center, Johnson, VT, 2001.